To set policies/legislative measures to enhance PGBh governance/administration in the delivery of public service. To build the capacity of the local government units and civil society in developing mechanisms to adapt to climate change and mitigate disaster risks. To provide equipment support services. To improve level of intelligence efforts in thwarting crime and insurgency. 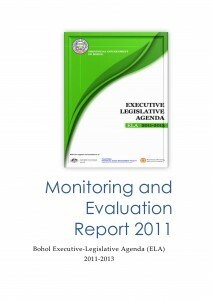 The ELA has no Monitoring and Evaluation (M&E) System and Organizational Structure of its own. It is depending on the existing Provincial Monitoring and Evaluation System (ProMES) of the Provincial Government of Bohol (PGBh) created through Executive Order No. 25, Series of 2010 issued by Gov. Edgar M. Chatto on November 23, 1010. It’s primary purpose is to facilitate implementation of project, solving of issues, monitoring and evaluation at the provincial and municipal levels.